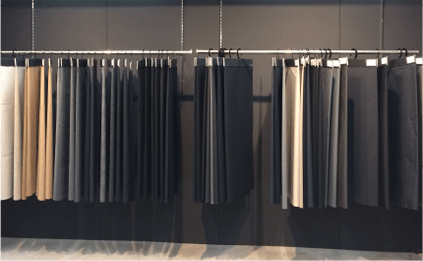 Menswear Fabric Div. 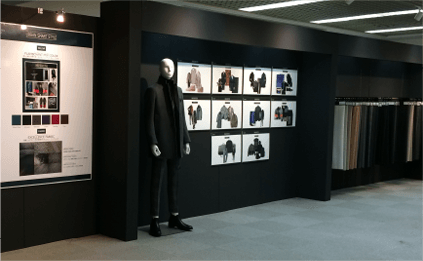 : Takisada-Nagoya Co., Ltd.
Based on our high market share of menswear fabrics in Japan and collective capabilities, the Menswear Fabric Division has developed a wide range of business from high-class to volume zone price brackets for the Japanese menswear market. The Division handles everything from dress materials, mainly wool, to synthetic fiber and knit casual materials. Our strongpoints are that we can promptly ascertain information from trade exhibitions in Italy and market research of numerous countries, as well as the needs of consumers in Japan, and combine this with a system in which all work is performed in an integrated manner, from planning to production and sales in order to develop original materials in a rapid manner. Among all the products we handle, our strength lies mostly in wool dress materials. Based on our resounding sales capabilities, we form linkages with prominent manufacturers at each of our production bases in Italy, England, China, and Vietnam in order to introduce the latest technology faster than our competitors and to develop original Takisada-Nagoya materials, which are greatly appreciated by our customers. The Division has also achieved differentiation in the casual materials market by managing the risk of high-mix small-lot quick-turnaround products for the rapidly changing casual market focused mainly on knit and synthetic fiber items. In the future, we will focus even more on natural materials that can serve as high quality raw materials, the development of original filaments in conjunction with manufacturers, and working together with dye manufacturers in order to develop value-added materials. We also develop planning solutions for products together with our Menswear Division and Product Division, and work in collaboration with our International Trade Development Division and TAKISADA(SHANGHAI) as we focus our efforts on sales to global markets. As the ready-made clothes market shrinks, we are challenging ourselves to open up the order and uniform markets to our products. Although we are a fabric division, we place great importance in visualizing the end product in our goal to create a system capable of providing timely fabrics that satisfy our customers’ needs in rapidly changing markets as we strive to further increase our capabilities in proposing planning solutions, and carry out even more thorough quality control and delivery deadline management. Copyright © Takisada-Nagoya Co., Ltd. All Rights Reserved.